Added by Citizen Reporter on April 5, 2019. 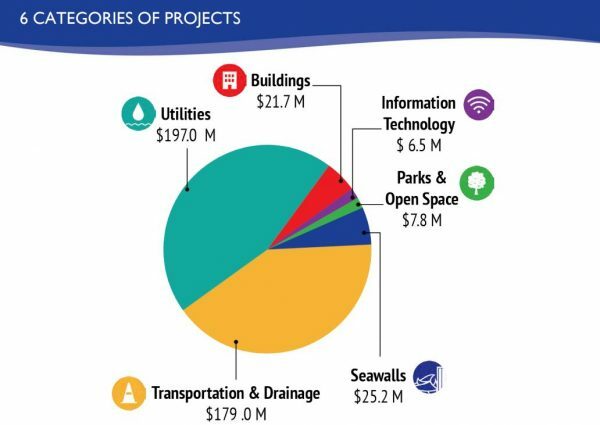 On April 2, 2019, the Oxnard Council tried to get its arms around a massive five year $437 million capital capital spending plan assembled by Public Works, Finance and other departments. While there seemed to be agreement on the needs, it was clear that there wasn’t consensus on priorities and that it is massively underfunded. But officials who spoke seemed to think it was an improvement over past attempts. City Manager Nguyen estimated that they are 87% there, but didn’t explain how he arrived at that figure or what it meant. Numerous Mandalay Bay residents* objected to: the city seawalls renovation plan which calls for them to pay 22 of the $25 million budgeted, the longtime neglect of the aging structures, and the 14 years of endless talking and negotiations resulting in only minimal work actually performed. The Council also approved the Housing Department’s capital plan, which is separate from the main city budget and grant-funded. Staff said no significant changes have been made to it. We were warned of an impending $10 million general fund deficit (why doesn’t our financial system warn of this more in advance? ), part of a seemingly perpetual structural deficit. In past years, this has been dealt with by interfund transfers and loans. We weren’t told what course of action would be taken this year. Earth Day was noted, along with its upcoming Saturday celebration at Plaza Park. Based on existing facts and circumstances, there is significant exposure to litigation against the City in one potential case. Agency designated representatives: Alexander Nguyen, City Manager, Steve Naveau, Director of Human Resources; and Jennie Kelly, Assistant City Attorney. Employee organization: International Association of Firefighters, AFL-CIO (IAFF), Local No. 1684. City Attorney Fischer said there were no announcements as a result of this session. 1.SUBJECT: Presentation of a Commendation to Pacifica High School students from the Academy of Business and the Health Science Academy who established a Firefighters care package center. 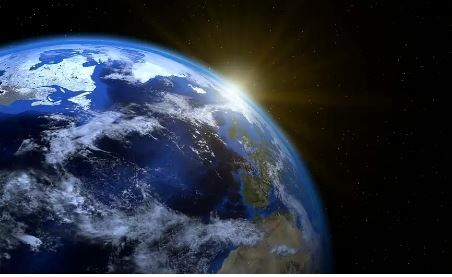 2.SUBJECT: Presentation of a Proclamation Designating April 13, 2019 as “Earth Day.” Celebrate on Saturday, April 13 at Plaza Park. Gabrielle LeMay- I had an Oxnard Home equity rehab loan- was abused by contractor who overcharged and did substandard work- reported it. He damaged my property, stole stuff. I now have PTSD. Was charged $23,700 for roof for that was worth $12-15K. Hymie Moreno- Recently promoted to head Football Coach of Oxnard HS. – Promoting the Summer at City Hall program. Need help from Council. 25 students involved in last summer’s program- paid and credit – learned new skills. Ashley Hernandez- Promoted Summer at City Hall program- Interned at Police Dept. Became Oxnard Police explorer and will pursue Law Enforcement career. Christine Cananyezado- Also promoted Summer at City Hall- Learned much, inspired her to pursue law. Brian Rodriguez- Jr. at Oxnard HS, was also in Summer at City Hall. Loved exposure to city govt. Wants program to continue, grow. Now working with Jacqui Irwin. Pat Brown- Big trucks take up too much room in downtown. Just saw one making a right on 5th St., taking up both lanes. Need action now. Get rid of junk cars at used car lot. Ann Jordan-Lives at Mandalay Bay. $160K allocated from Oxnard Waterways District. Wants to know what we are paying for. They told her it was for benches, irrigation , plants., pruning, weight control. None of that has anything to do with waterways, seawalls. Money is not being used wisely. There was talk of increasing the assessment, which is needed for seawalls- maybe up to $1500. Pete Placentia- Re Colonia Boxing Gym. Helps kids. Problem with leaks in gym. Floor is wet. Also water upstairs. Arnaldo Torres- Representing Camino Real consultant. 80,000 people of 204,000 population on MediCal in Supv. Zaragosa’s County District. Needs a better system. Zaragosa should have moved on this years ago. System is now under federal audit. Wants the “Two Plan Model.” Want local meetings to discuss. Evano Morales (translated)- From Rose Park community. Want study done of the garage. Was told that he didn’t qualify because he only has 2 cars, should not be discriminated against. Others are being allowed to do it. Mario Castille- Community workforce agreements. Plan to recruit and hire low income, veterans, women workers, with targets. No strike provisions.Helps prevent delays, ensure quality, safety. 200 projects with $480 million in total. Jonathan Duran- Represents SW Regional Conference of Carpenters. Tell students about opportunity to be part of a union. Represent 400 carpenters in Oxnard. Mayo Castro- With Carpenters. Vocational programs should be restored in schools. Armando Delgado- USMC vet and a carpenter with local 805 Carpenters- 1700 members, many in Oxnard. Unions provide a decent living. We want to recruit, train people. Victor Gajarrdo- Same basic message + good for local economy. He is a longshoreman. 1. City Mgr. Nguyen. We have $480 million in unmet capital improvement needs. Only have a small fraction of this available. 2. Job Fair – Fri April 12 at 2 PM at Oxnard College. Many more employers now signed up and will be present. Ramirez- Encouraged Plaza Park Earth Day event participation. Went to water education for Latino leaders meeting- fine presentation by Development Services Dept. Mgr. Jeff Lambert. Re: Clean Power Alliance- people getting first bills. Says her bill went down $6. She is chair of energy procurement/planning, to bring projects here. Will approve 2 new local solar projects,. which have project labor agreements. Basua- Went to Pacific Point HOA meeting. Re: Homeless community problems. Thanks for City staff support. No doubt that we have an issue- an epidemic- in all districts. Need budget money for this. Must set policy for staff to follow. Madrigal- Today is World Autism Day/month. Thanks to police dept for job well done. Went to Rose Park and Southwinds meeting. This Thurs- East Village meeting. Frank School art Gala this Thursday (after school program). Went to East Side Little League’s opening day. Went to Chavez march and Downtown Dist. meeting and homeless discussion. MacDonald absent- in DC on behalf of Naval Base affairs. Flynn- on new meeting system, only twice a month now. Most business now transacted by committees. Most business tonight is just consent agenda approval. City council undoing decades of mismanagement and financial problems. Anticipate up to a $10 million deficit. Unfunded pension liabilities is a big problem. On Tuesday, CFO will give a financial projection- encourages meeting participation. Ten different approval items,. See agenda for details. Flynn says all items, some very large, were already covered by committees, televised. Pulled for discussion- K-3 (Madrigal), please postpone this on behalf of MacDomald, who is in DC now. L-1- SUBJECT: Zone Text Amendment to Oxnard City Code Chapter 16 Article II and Article V, Division 13 Related to Accessory Dwelling Units: Continuation of Public Hearing. 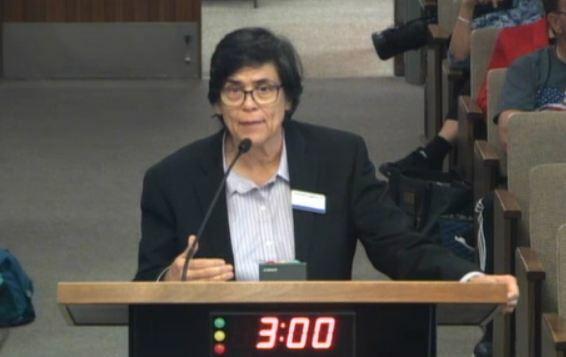 RECOMMENDATION: That the City Council continue the noticed public hearing to the April 16, 2019 City Council regular meeting. e. Authorizing the Housing Director to accept and expend the funds as indicated in the revised 2019 CFP Budget and CFP 5-Year Action Plan. Legislative Body: Housing Authority Board Contact: Rhonda Hodge, (805) 385-7889 . Requested $1.482 million for 2019. This approves action plan, budget and agency plan. She said zero about what the money would be used for. Ramirez- did public have input? Lopez said no significant recommendations. Ramirez- how many were there? 15-20 + staff. Perello- Any other feedback? Parking is an issue, especially for elderly/disabled resident parking. Fencing was a question, color of paint, “micro level” issues as Lopez termed them. Madrigal- For La Corta project. When will old buildings come down? Lopez- 10 families still there. She estimates 6 months, but can’t be sure. Basua- Scores? Lopez: Last year we were a high performer. This year standard performance, because we can’t invest $ in Las Cortez, which is being torn down. New units “RAD”, which is a non-profit independent organization. Ramirez again. Old units in bad shape and at risk of being broken into/occupied by transients. Lopez confirmed that- An ongoing problem. Ramirez wants police intervention. Perello again- Wasn’t there a fire recently? Yes, vacant, no one harmed. Councilwoman Lopez- 30% of budget is capital improvement? What about the rest? Lopez: debt service, admin, technology, ADA “504” compliance. New units will exceed the number of old ones. Flynn- Federal 1998 public housing reform law mandated self-sufficiency. How viable is Oxnard’s program to do this? Residents must donate 8 hours community service a month. Non-compliance results in loss of lease. Want people to become self-sufficient- move out of public housing. He says he’s brought this up annually and never received a satisfactory answer. (so, why does he vote for it, then?). Lopez gave a list of excuses why many residents can’t be self-sufficient. Families are becoming self sufficient, but not enough to move out of public housing. Flynn wants City Manager report on what we’re doing to help public housing residents become self-sufficient. 3. Approve the proposed list of non-CIP redevelopment bond proceeds projects and appropriate funding to these projects. Nguyen- Stated at Transportation and Public Works Committee- has 87% confidence in what is in this capital improvement plan. Feels it is a significant improvement to the previous plan, which was almost impossible to use. Tremendous progress made. Will continue to refine and improve annually. Some have large, multi-year projects. Constitutes $480 million in unmet needs- much is deferred maintenance. People demand budget funding, but not cuts and setting aside for future needs. Perello- a sobering speech by Nguyen. Average City Mgr turnover is about 3 years. Nguyen has courage to mention shortcomings of the plan. Asst. City Manager Shari Klima- Started off with opening line of the song “We built this city on rock ‘n roll” – relevance was uncertain. 2019-2014 Five Year Capital Improvement Program. Doesn’t address maintenance- it addresses construction/renovation projects > $100,000. CIP was posted on line- approximately 200 projects. Grant funding considered. Staff capacity considered. Balancing competing needs. The linked presentation/reports do a good job of summarizing what is in the CIP. Clearly there is much work to be done in prioritization, consensus building and funding, since much of this is an unfunded wish list at this point. Storm water catch (SIC) basins- regional board is telling us what we need to do- not discretionary. Requests that council prioritize within category 1 projects (about $4 MM) and select priority 2 & 3 projects if they have funding. These are overwhelming transportation and utilities projects. ($179MM in 5 years). $25.2 million for seawalls is only in the next 5 years (estimated $80MM total but even that may be low). The plan calls for owners to fund $22 million of the $25 million for the first five years). Bonds would be required. 40% of city buildings are said to be in poor condition, needing significant work. over 1000 PC’s and 1500 mobile devices are in city inventory. Quite a few IT projects are in the city. Data center and networks projects are needed. Parks and city facilities 48 sports courts- $3.9 mm needed. 53 city parks – most need work. City has 56,000 trees and is far behind on maintenance (not sure how this applies to capital budget). Street Pavement Condition Index (PCI) is now a substandard 65. $82MM in the plan- $16.4 MM annually. Current rate of spending of $8MM would result in third world conditions in only a few years. An $11 mm rate would maintain it at a level of 65. It would take $15-16 MM to bring it up to desired standards in a few years. The new gas tax funding will help, as would more grants. Transportation and drainage. (see slides). There are nine major water projects. This does not include housing authority stuff (separate fund/budget), except for the two city-owned housing projects. Many funding sources, General Fund and Measure O, are default sources. Development fees, and grants. State gas tax funds some street resurfacing projects. Ratepayer-funded utility funds handle much of it. Special districts funds handle some projects (see Appendix A for funding sources). No attempt was made to balance projects by district, but by need. (see Appendix B for district breakdown.). Mayor Flynn- what decisions need to be taken? What positions were taken by commissioners (this was posted before they met)? Funding? Klima summarized some briefly. Flynn asked for roof, VSR, traffic signals, were a few. MacDonald was in agreement with priority 1, also wanted adaptive traffic signal project. 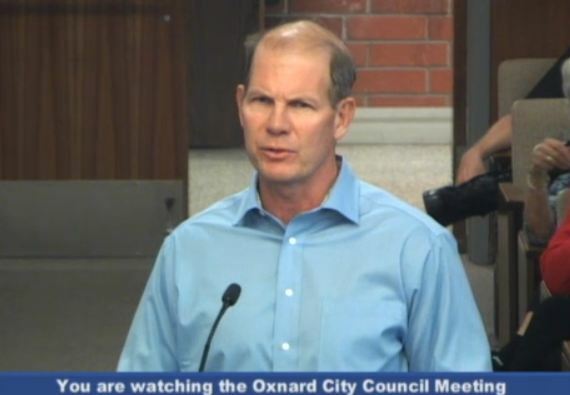 Ray Blutel-Representing Oxnard Tennis Center users. Thinks it should be priority one. Claims center is used to maintain one’s health. Courts have severe cracking and uneven surfaces- getting worse. Debbie Mitchell- The City presented a funding plan for seawalls in 2006. Back then, a tripling of the assessment would have been required, which would have brought that to $1.3MM annually, still not enough, but it would have been something., Do pilaster repairs now. We have the funds. Do not further defer maintenance. It’s not even priority 1 in the plan now. City Mgr. Nyhoff had said it would be insane not to proceed with this project. Start the pilaster project now. Patricia Eunice- Good presentation of long range, smart planning. You have made some commitments that need careful consideration. Take time to review it first. I live in Mandalay. Seawall issue has been so ever casually dismissed, year after year. Your goal of protecting city assets was ignored, even though permitted, approved and funded. This is a health and safety issue. This could impact health, safety and city’s reputation. Carol Taylor- Mandalay Bay resident. City is deferring critical pilaster project and place us in potential litigious situation. Inflation is our enemy here, too. City staff turnover requires constant re-education and redirection. Judy Havis- Mandalay Bay resident. Wonderful report. This is a complex city with diverse needs. Little said about how the seawall money will be addressed, How are you dealing with this particular issue? No seawalls collapsed yet, but what will happen if they do? Have to get started with funding. Tom Schiller- Had a boat in Channel Islands harbor since 1988, lived here since 2008. Saw Trans Systems report. Two projects, neither implemented. Now looking at a completely different approach, to drive galvanized sheet metal pilings and insert concrete filling. He questions if it will work (he has a contractors license). It would also force the removal of docks, pilings and decks, which could cost another $80MM. Allison Gable- Need more research on funding and what we are doing. This is critical for community. Bill Clark- Mandalay HOA President. Funding will be a problem, The $500K annual fund is obviously insufficient. Funding plan needed. The $80million current estimate could go 40% higher and is not indexed for inflation. Flynn- when will study be done? Gaglione- 3 months then go out for bids. 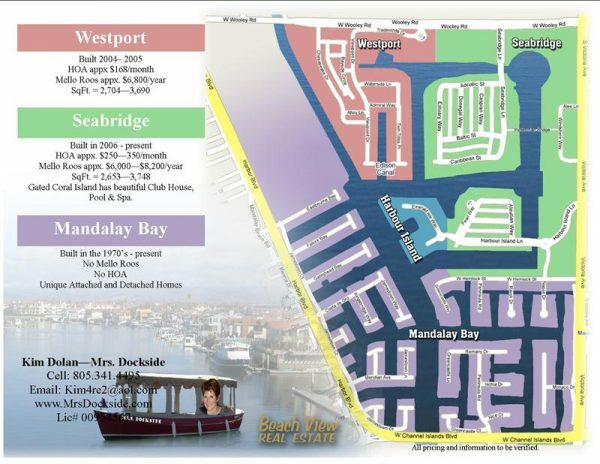 In the 1970’s, the city, in its infinite wisdom, elected to build and own the seawalls and greenbelts in the all-waterfront Mandalay Bay subdivision. The developers, in their infinite wisdom, elected to have a loose, non-mandatory membership homeowners’ association, which even now only charges $50/year membership for those civic-minded owners who elect to join. At the meeting, a well-organized speaking effort by Mandalay Bay residents exposed the city’s longtime neglect of the crumbling 7.6 miles of seawalls it owns on those canals and requested meaningful and cost-effective solutions. What triggered this effort, besides inadequate action for 14 years, was that the capital plan called for the residents to provide additional financing for $22 million of the $25 million budgeted for seawall renovation over the next 5 years. They may previously have been led to believe by the city that they would have to come up with only half of the funding. Previous smaller projects have patched up the seawalls over the years. Now that they are approaching the end of their useful life, major work is required. The residents have attempted to engage the city for at least the last 14 years, but have not been able to finalize a master plan and financing, although some work has been done in some of the high-risk areas. HOA officials told me that negotiations seem to reset back to square one whenever city players change. New Public Works Director Rosemary Gaglione has challenged the entire engineering approach and is conducting studies to determine what is most feasible and cost effective. Her current idea of driving in galvanized sheathing and back-filling with concrete would necessitate first removing all of the residents’ decks, docks and pilings, an extremely expensive and disruptive undertaking. The magnitude of the project would require much higher waterways assessments on property tax bills and new bonds to finance the projects in the interim while the money is raised to pay them back over, say. 30 years. The two biggest issues are engineering approach and cost sharing. Perello- supports the roof work. Make new building have a standard roof approach. Will we make a decision on some Oxnard assets being surplus/liquidated/fixed up? Streets very important. Have a big alleys problems too- not fully addressed. Can we blend and co-mix general and enterprise (mostly utility) funds. What about our 42 inch outside water supply pipe’s cathodic protection? Lopez- A lot of projects and not enough money. Agree with priority assignment. Can we use bond $ for something other than it was designated for? Madrigal- Priorities are food, shelter and clothing. Other things are wants. We face this situation as a city. So, it will include getting bonds. Two years from now we’ll be even worse than today. Civic Center east wing has $152K general funding. Yes, need roofing. Residents preferred soccer field over basketball court resurfacing. Flynn- Financial overview: Good news 40%of a half billion dollars in projects are in utilities, which are funded by rates and have healthy reserves. The bad news- the other 60% aren’t. Can use measure O and redevelopment monies (and grants?). We’re not now on an sustainable (financial) path. General fund is $130MM., For a city this size, it should be $180MM. We are short $50MM every year (not deficit, but shortfall to needs). The City will either have to raise taxes or cut spending. He hinted at raising sales taxes by contrasting Oxnard’s to others. Aquifer project (recycled water) has been stopped. We need it. But he said it’s not certain that it will even work. Feels strong about traffic signals and fiber optic plan. Re: Seawalls- bottom line is that value engineering survey is looking for an alternative. No one has made a final decision on solution. Residents are scared. Have to make sure that any pilaster needing repair gets done right away. Really need to get started on building reserves- need to cut services, raise taxes or both. Nguyen- Addressed some questions- Re; Perello’s question on mixing funds- interfund transfers/loans are legal if done properly and have clear repayment schedule which is executed. Yes, we should sell unneeded properties- yes- city is beginning that process. 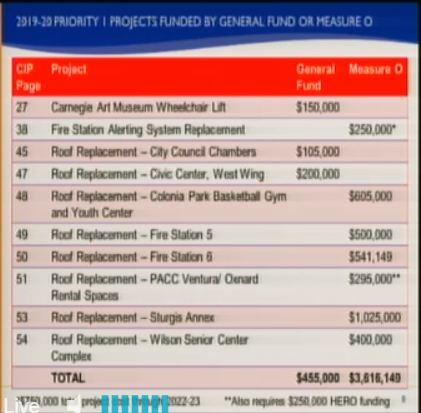 Bond proceeds (Lopez question)- Re: financing projects- not convinced that it is the moment- will have Finance look into it. He thinks the roof costs are higher than shown. We really don’t have any general fund dollars (available for projects?). Will try to cut basketball resurfacing and also address soccer fields. Perello- where do we stand on reserves, what is the action? How will it affect our new bonds? CFO- we’re well below our (reserve) targets. (Bond rating) agencies are more concerned about structural balance between revenues and expenditures. Lowering reserves indicate a problem. Staff says that roof work is FULL replacement of designated buildings. Thien- Asst Public Works Director. Cathodic protect is to avoid corrosion. A sacrificial anode is to use up another piece of materiel (sacrificed) in lieu of the asset (pipe). Madrigal/Basua- remove #45 and 47 from current fiscal year. Fire stations 5 and 6, Police annex and others were highest priority. Public works- 11 roofs need replacement. Mayor Flynn attempted to adjourn the meeting, but was reminded that a vote was required. Debate went on about project priorities and funding for some time, with little progress, before they finally voted …. Adopted the CIP. Acknowledged that hard priority and funding challenges lie ahead. The author is a Mandalay Bay resident. Thank you for This great reporting! We’re not now on an unsustainable (financial) path. Should be We’re not now on a sustainable (financial) path. Yeah, thanks, Tom- corrected! How could we be with a $10MM deficit and $50MM/year in deferred work?